Kinzler fireproofs this central Iowa hotel project with CAFCO-BOARD. 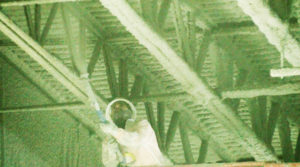 CAFCO-BOARD is a rigid mineral wool board which Kinzler’s expert installers mechanically fasten to structural steel decking, beams, and columns. It also provides excellent thermal value and acoustical control! Contact us today to see if CAFCO-BOARD is the right solutions for your next project! Kinzler Construction Services was recently hired to help prepare for this epic fair by installing spray foam insulation and intumescent paint on a metal building at the fairgrounds. Our expert installers were under a tight timeline and got the job done quickly in hopes of keeping the thousands of visitors going through this building cooler! We followed our proven process for quality installation by inspecting the completed job and grading our installers on the quality of their work. 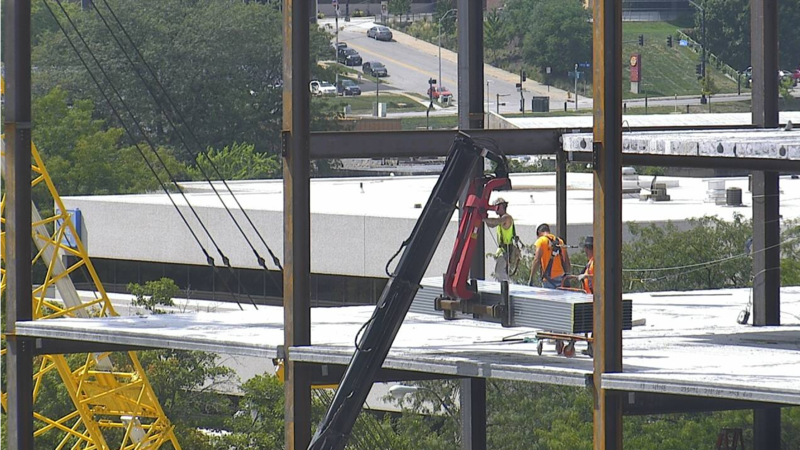 Kinzler’s boom truck, loaded with steel framing, lifts the material to the top of the 219 East Grand project. Des Moines East Village’s newest retail, dining and upscale residential development is quickly taking shape! 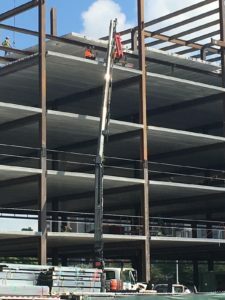 Kinzler Construction services was hired by Heartland Finishes, Inc. to supply the steel framing for the 219 East Grand project, offering 17,000 sq-ft of commercial space as well as 98 residential units, including 13 luxurious Penthouse apartments. 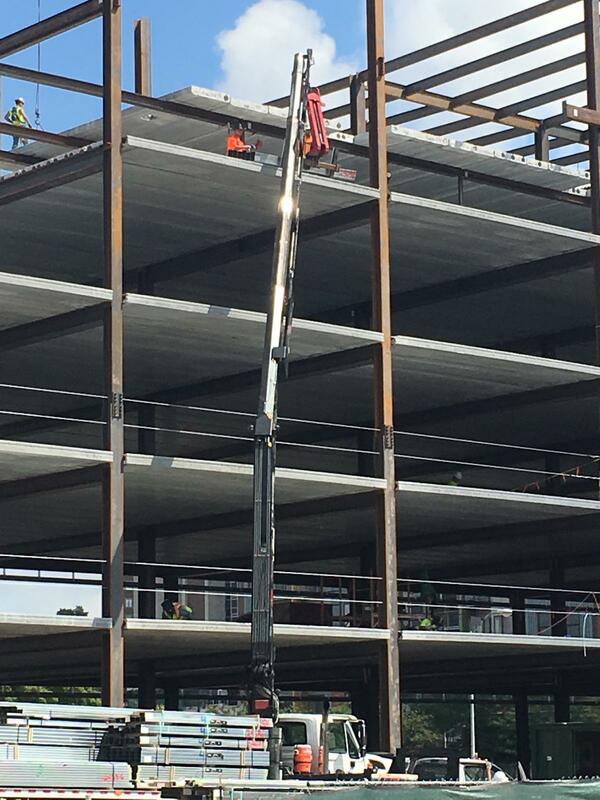 Kinzler’s huge boom lifts easily maneuvered the massive amounts of steel throughout the six-story structure. Our crews then unloaded and delivered the material to install locations. 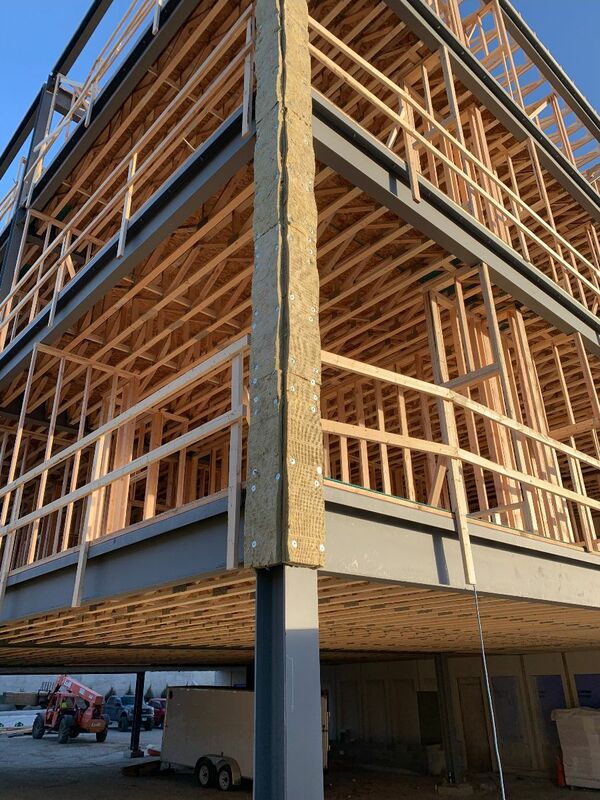 Once constructed, Kinzler Construction Services experts will return to deliver drywall for the building and install insulation and fireproofing material. The building is set to open summer, 2017. Kinzler Construction Services has the capability, capacity and customer service to make a huge job like this one successful. Contact us to partner on your next project! Kinzler crews unload steel framing into the building.